Beer doesn’t make too many appearances here, so when you see it in the title, expect it to be special. Today I thought I’d try and get a recipe in before a holiday arrives, kinda a big deal around this site. For me, Easter has always been about the baskets of candy. Although I may have been raised Catholic, I jumped ship from that a long time ago and now Easter is another holiday associated with a big family meal. And chocolate. Lots and lots of chocolate. For this recipe I teamed up with a friend of mine who recently joined her Dad’s business… of MAKING CHOCOLATE at Kakao Berlin. How cool is that job? Kakao Berlin is a non-GMO chocolate company that sources beans from all over the globe and is crafted in Germany, the land of chocolate and beer. She gave me some chocolate to try out and I settled on a nice semi-sweet 64% (Stuttgart). If you want to go darker the 75% (Brandenburg Dark) is fab too. Oh? What are we making today? BEER MOUSSE! I was introduced to the many uses of beer by an old work colleague of mine several years ago. He was the type making cheese and beer in his apartment before you started hearing about everyone making their own cheese and beer. 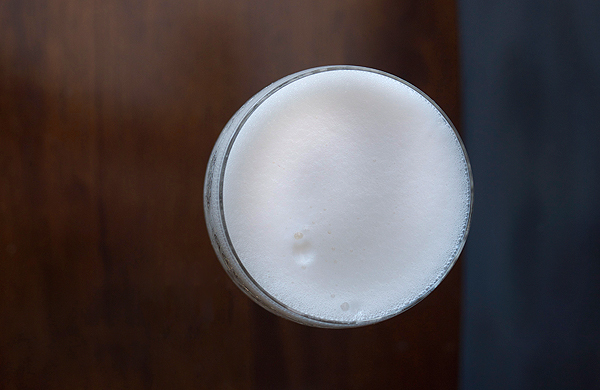 He introduced me to beer ice cream floats and beer mousse among other other recipes. The beer mousse here is made from scratch (unlike the first version I ever tried using a can of powder. It was gross; don’t do it.) and it’s super easy to whip up, although you’ll need 3 bowls. Sorry. 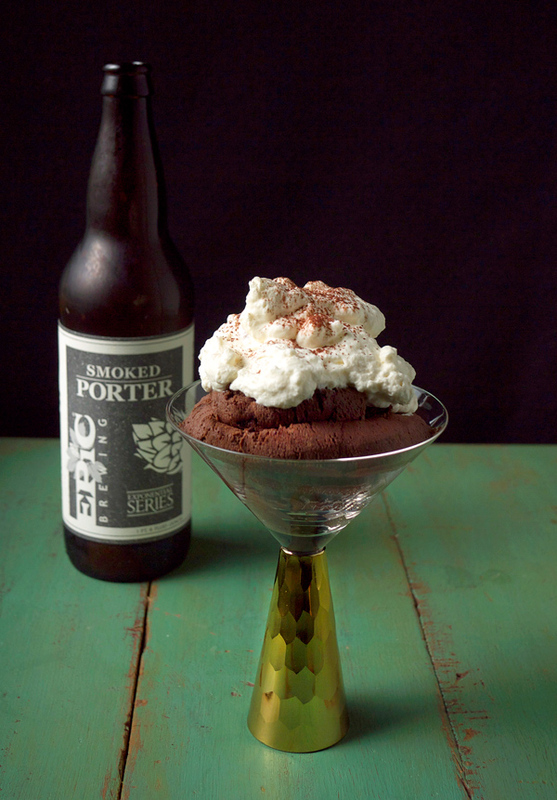 Ask your significant other or roommate to be on dish duty with promises of fluffy chocolate mousse with hints of smoky beer. Watch how quickly they wash those bowls. Also, a big thanks goes out to Jackie a.k.a. the Beeroness, who helped me with this beer and chocolate pairing. She has a chart; go check it out. The beer that worked the best here was Epic Brewing’s Smoked Porter. 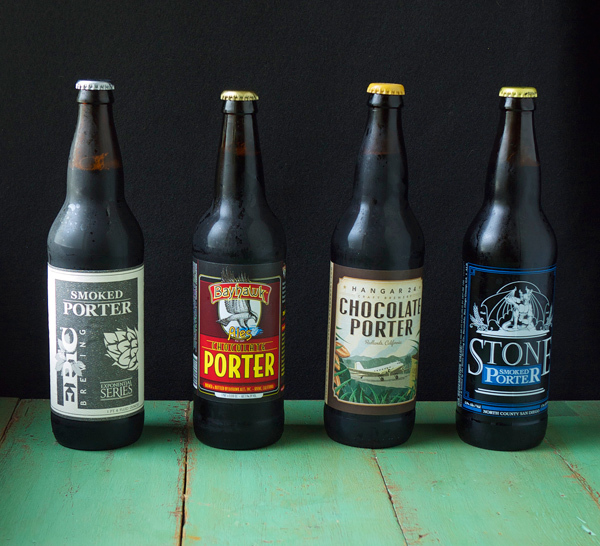 The smokiness is more aggressive than Stone’s Smoked Porter, so take that into consideration when making this. I tried a few chocolate stouts too, and found it a bit redundant to put into chocolate. The best part is that you don’t use too much beer in the dessert, so when it’s done you can “pair” the rest of the beer with the mousse. It works. Couple of tips: don’t go too stiff on beating the egg whites or the cream. I did that on the first batch and sadly it did not incorporate well into the chocolate and looked weird. Tasted great so I ate it all, but, alas, not photogenic. You also don’t need a double boiler to melt chocolate. A sauce pan with about an inch of water simmering with a heat-proof bowl over it works great (and is my way). If that doesn’t work for you, very carefully try the microwave version. You just need to watch that and melt in small time increments since it will easily burn. Fill a sauce pan about 2″ with water and place a heat-proof bowl over the top. When the water is simmering, add chocolate and beer. Start stirring to combine. You want the end result to look glossy. At that point remove from heat and set aside to slightly cool. 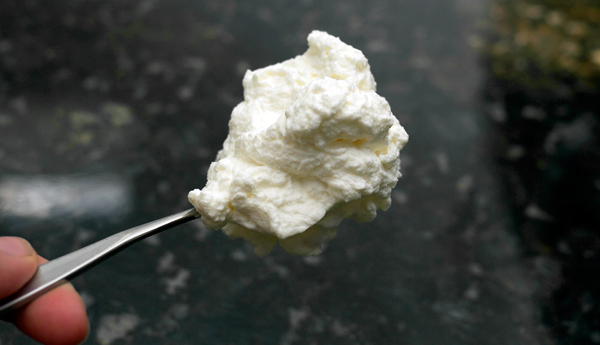 In a separate bowl, beat the cold heavy cream until firm, but not stiff peaks form. A chilled bowl will help move this along. Fold the cream into the chocolate/beer mixture. Lastly, beat the egg whites until firm, but not stiff, peaks form. 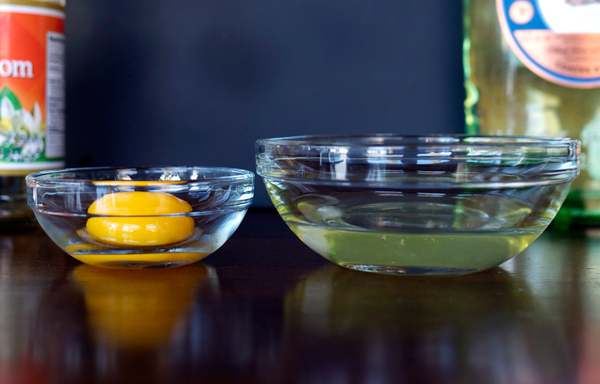 Fold in half of the eggs, and then stir in the rest gently. Chill mixture until ready to serve, at least 30 minutes. *If you’d like some homemade whipped cream for this, beat together 1/2 cup of cold heavy cream, 1/4 teaspoon vanilla extract and 1 teaspoon of superfine sugar until you reach desired consistency. Not too sweet and richly chocolate with hints of the smoked porter. 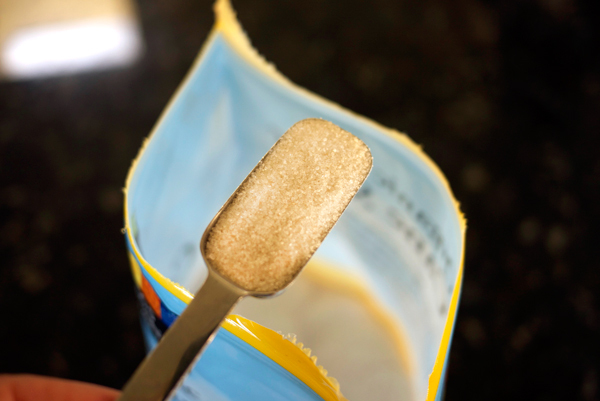 The mousse firms up quite a bit in the refrigerator and gets a more ‘dense’ consistency to it the longer it sits. So, if you want a more delicate, light as air dessert, eat it out of the bowl. Weekend mornings always start with several cups of coffee. Years ago I had a French Press but it was kind of chintzy and broke on me; I only just replaced it a month ago. Since I am the only one drinking coffee in my house, I still make a full pot and will pour cup after cup, not thinking about how much caffeine I am ingesting until hours later my heart is pounding as if Animal is playing the drums in there. I’ve started to cut down on the coffee by replacing the giant coffee pot with a French press. It’s very unlikely I will clean the whole thing out just to make another round too. So why the coffee talk? Well, because it’s the base for this month’s Mixology Monday cocktail! 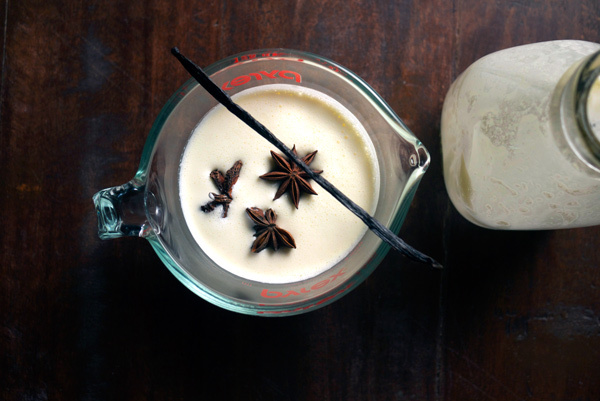 No, it’s not a coffee theme, Nick from the Straight Up blog has given us ANISE as the special ingredient this month. 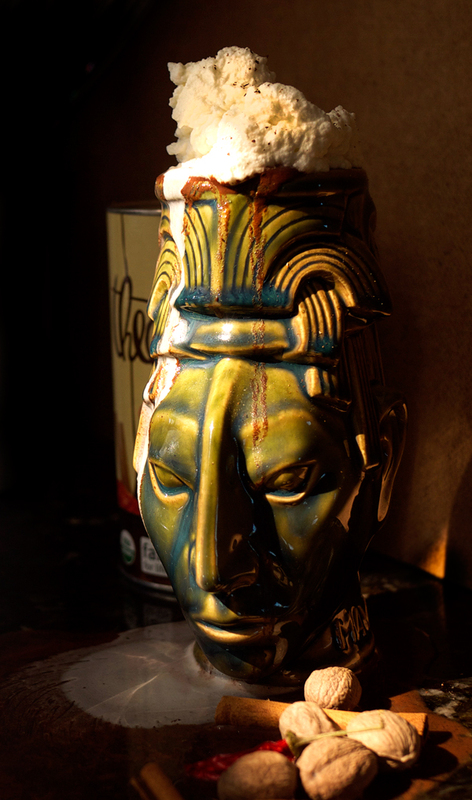 Since it’s all kinds of cold lately, I decided a nice hot, boozy drink was in order. But where to put the anise? In a cream! Seriously though, I saw this challenge as an excuse to go buy myself a whip cream dispenser. It will have other purposes later (none of which will include whippets FYI) so I figured now was the time to splurge on one. Tis the season to give (to oneself). In a small sauce pan, combine all ingredients over medium-high heat. Bring to just under a boil and reduce heat to low. Keep at a simmer for 10 minutes. Remove from heat, cover and let stand until room temperature. Strain the mixture, cover and refrigerate over night. 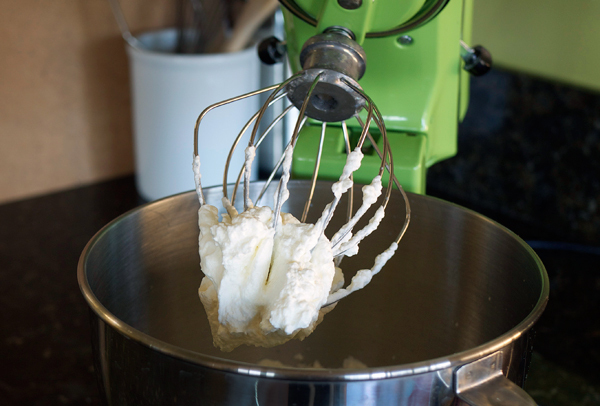 The next day, whip by hand (stand mixer, hand mixer, etc…) or funnel contents into a whipped cream dispenser. Keep refrigerated if not using right away. In a glass mug (or regular mug if you want), add simple syrup, rye and coffee. Stir gently to combine. 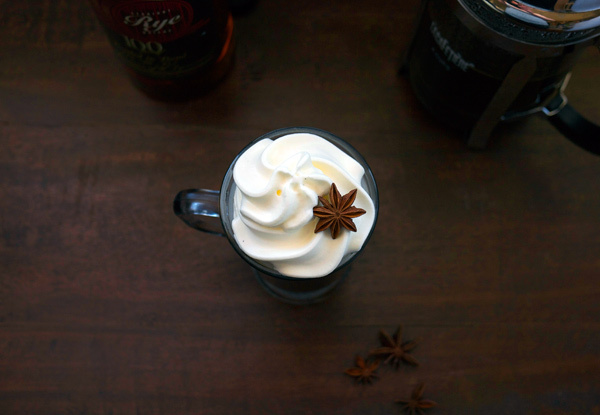 Top with anise vanilla whipped cream and garnish with the whole star anise. By itself, the coffee and rye are quite strong, and too…’alcohol forward’ if you catch my drift. 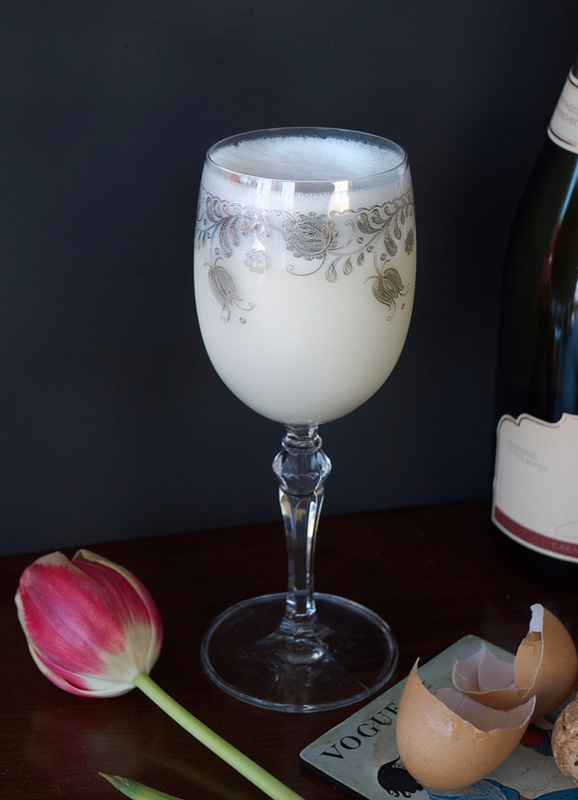 The cream drastically cuts that back and evens out the whole drink. Rye and anise are a wonderful combination together. Although usually strong flavors on their own, here they work as accents to the other players in the drink. The espresso has an earthiness that pairs well with the vanilla, and as a whole, the drink is only slightly sweet with a nice kick of spice. 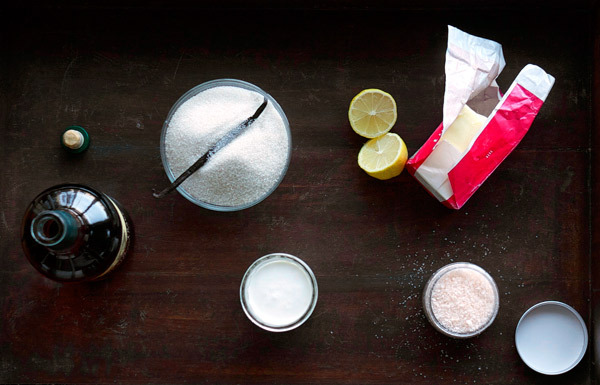 Why not put sugar in the cream mixture? Personally, I’m not a big sweet drink drinker. Here it’s important to balance the sweetness of each drink with the person’s preference. 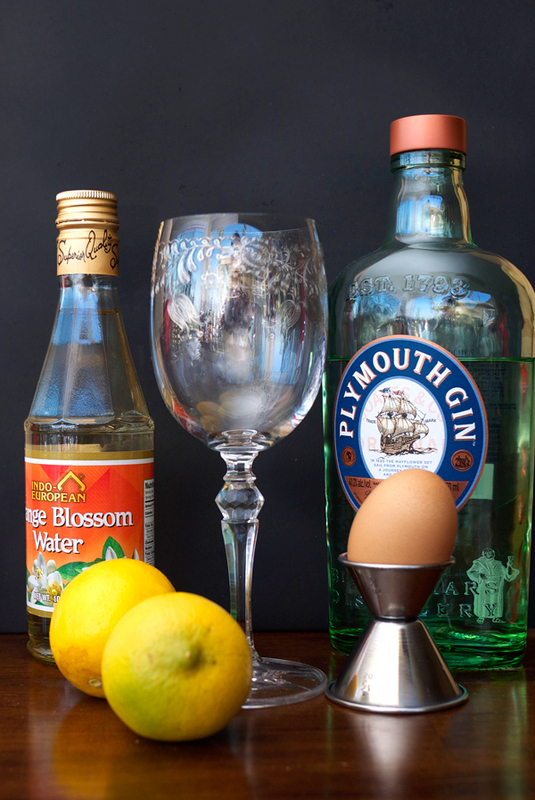 Did I mention this is a great brunch drink? 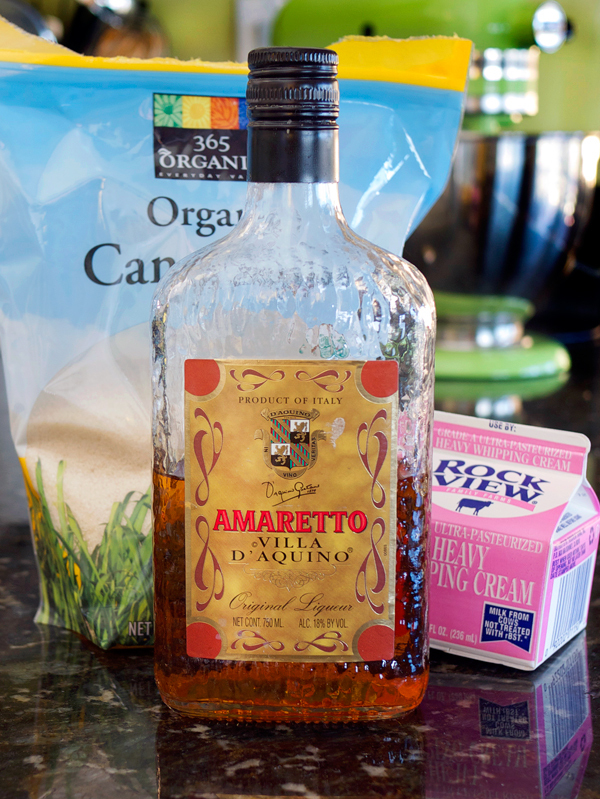 Whipping cream has a slight sweet edge to it and I find that adding a touch of simple syrup to the coffee itself disperses enough sugar throughout. 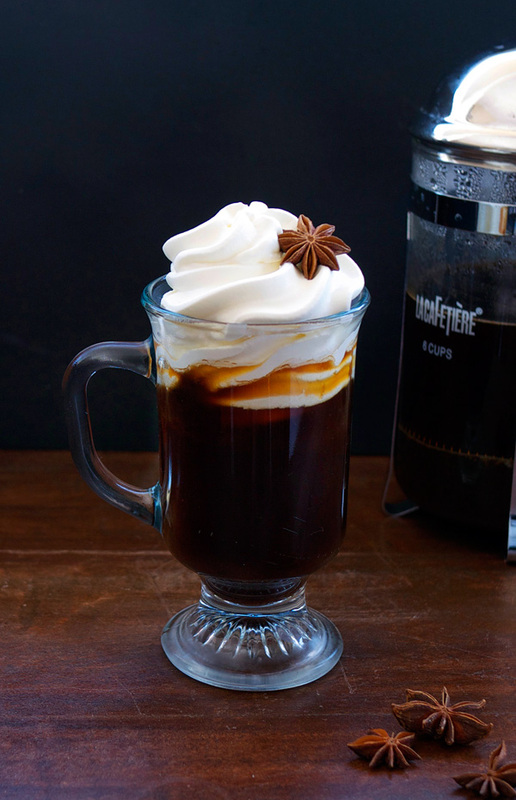 Could you flavor the whipped cream to just be sweetened? Yes, Add about a 1/2 ounce of simple syrup to the mixture before beating/funneling into a whipped cream dispenser. About this time every year I start mentally writing an inventory of things I should start making for Holiday gifts. I have to think about it this early because I usually forget until about a week before Christmas, freak out, and consult the list I made two months ago. This is just how I deal with life and presents. I was totally that kid that baked for the holidays and passed out cookies and got my teacher a Valentine’s Day gift bag (admittedly only once for that. But she was a great teacher and it was an excuse to buy heart colored tissue paper.) and since starting this blog and just, well, making A LOT of stuff, I’ve been going full force at edible gifts for the Holiday season. Rewind back to a few weeks ago and you will find me wide-eyed in front of a steaming sauce pan of sugar and butter and other deliciousness. Myself and a friend decided to take a caramel making class, the selling point for me was the “Beer and Pretzel” caramels on the list of what we would make. Seriously. Beer reduction and pretzels and caramel living together in one bite-sized wrapper. Oh, but the wrappers. The only aspect I wasn’t prepared for in this class, after spending two or almost three hours making caramels, was the hour long process of individually wrapping each damn caramel I made. After an hour I was kinda done with caramels for the time being and I brought them all in to my office the next day. The beer ones being the surprise hit. 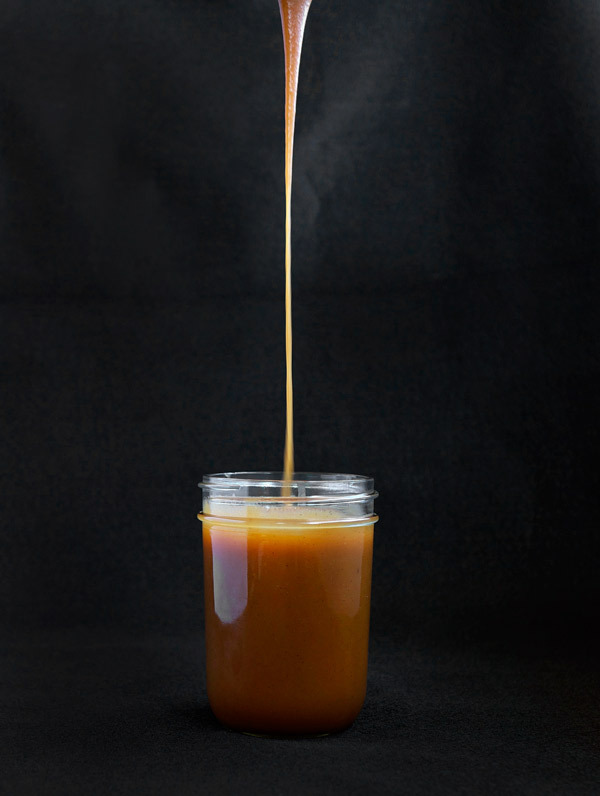 One of the last recipes we tackled that night was not actually a candy, but a sauce: caramel sauce (it was, after all, a caramel class). This sauce made its way into a cake about 3 days later. And now it is making its way here to the site. Why? Because I’ve decided to add some Bourbon and vanilla beans to it and make jars of it for presents this year. Friends, you are welcome. Try not to eat the whole jar in one sitting. Are you thinking this is going to be too hard? It’s not. I had one hand holding a cell phone trying to pay attention to my mother while she went on about something for 45 minutes and started and finished this whole recipe by the time I got off the phone with her. That includes prep by the way. Don’t want to give this as a gift? Ok, put it on ice cream, or sandwich it between cookies, or DO YOU REALLY NEED A REASON FOR CARAMEL SAUCE?! Caramel is boiling sugar. The recipe moves quickly so get all your ingredients together before you start and please, try not to spill it on yourself, it will hurt like hell. Carefully add the cream. It will bubble and hiss like crazy, but this is normal. Bring back to a boil, then add in butter, salt and bourbon. Stir to combine and until slightly thickened, about 3-5 minutes. Let cool and then jar up. Your sauce is going to look watery at first. Don’t keep cooking it. If you pull a spoon out of the sauce and it leaves a layer, your sauce is thickened. As it cools it will thicken up much more. And once you stick it in the fridge, the next day it’s even more thick. DO NOT STIR IT WHILE IT COOKS. Just don’t, it will create crystals and it will be grainy and gross. The bourbon is added at the end, so you will taste it. That is the point of adding it to the sauce. Don’t like bourbon? You can add an aged rum if you like. Or just leave out the booze too if you have to. 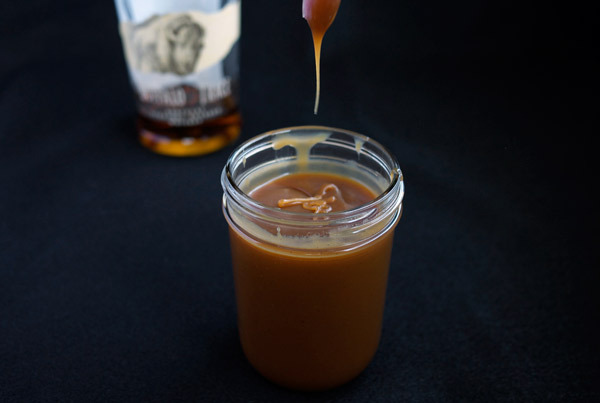 Besides the lovely bourbon taste, mainly you are going to get a buttery, salted caramel with hints of vanilla. And you will keep telling yourself, One more spoonful, until there is nothing left. This year, while thinking of a St. Patrick’s day cocktail I recalled a post on a website that made chocolate, whiskey, and beer cupcakes. They’re fantastic, albeit a lot of work, FYI. And as much as I wanted to do something similar for the Low Rent Cocktail of the Month in March, I thought something less obvious would be better for my Irish Holiday. But something with Irish Whiskey all the same. 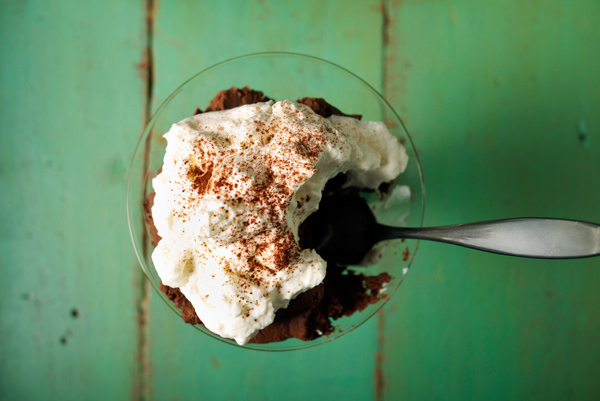 So this month we’re ‘baking’ up the alcohol and throwing it into truffles. Chocolate Truffles can look amazingly elegant, but let’s not kid ourselves. They are chocolate we melt, let it get hard again and form into balls which we eat by the handful. Not as much work as those cupcakes but just as nice looking. Taking it a step further I also dehydrated (as best as I could) Baileys Liqueur to keep with the Irish-ness of this alcoholic dessert. 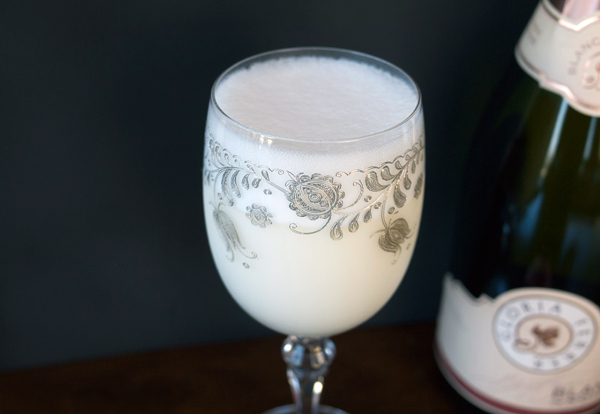 Initially I was going to fill the truffles with the Baileys until I saw this post on the Alcademic’s blog, where I learned about the world of dehydrating liquors for cocktails. Totally blew me away as I now had a new concept to play with. Dehydrating the Baileys though was tough. Keeping the basic rules to follow from that post, I still ended up keeping it in the oven for about 36 hours at 170° and all of the liquid never fully dehydrated. However, enough did for a lovely crunchy topping to put on the truffles, so not all was lost. 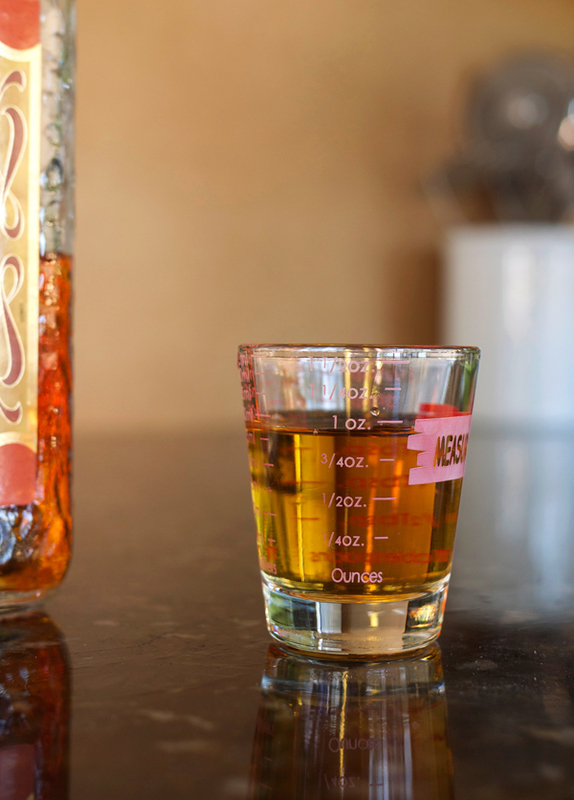 One change for the next time I dehydrate liquor (or a liqueur), is to keep it in a thinner layer. I found that the bottom liquid stayed gelatinous under the top crust that crystallized first. Best advice for any of you wanting to try this is to test several times to see what works best in your oven! 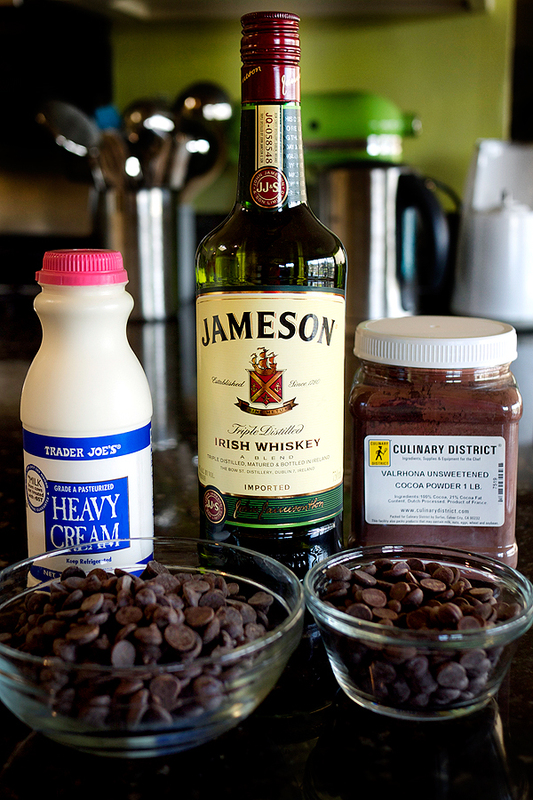 I use a 1/4 cup of Jameson in this recipe. That might seem like too much, but the flavor becomes very subtle as it is mixed into the chocolate and cream. It is definitely there, but not blaringly WHISKEY. If you want more of that flavor, slowly try adding in more and tasting as you go. Keep in mind that the whiskey does not cook out, since it’s added in at the end, so let’s keep this dessert 21+. Place chocolates in a medium sized heat-proof bowl. Set aside. In a 1-1/2 quart saucepan, heat cream on the stove until boiling and immediately pour the cream over the chocolate. Let sit for five minutes. Stir chocolate until smooth. If, like me, you did not chop your chocolate fine enough, you may need to create a double boiler (by placing your bowl of chocolate and cream over a sauce pan of simmering water) and reheat chocolate until fully melted. Try and chop it fine on the first try. 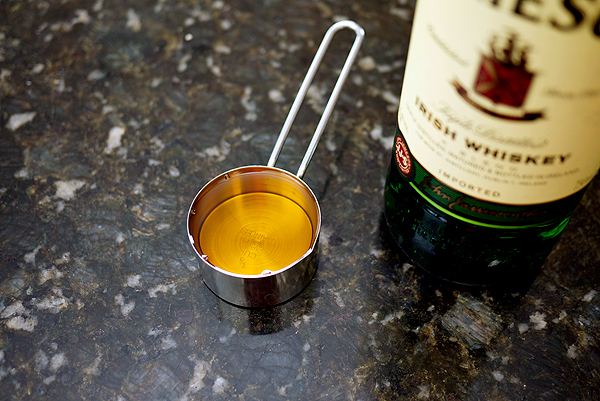 Stir in Jameson. Mixture will look separated, however keep stirring until smooth- it will happen. Refrigerate for about an hour until firm but not rock solid. Line a baking sheet with parchment paper. 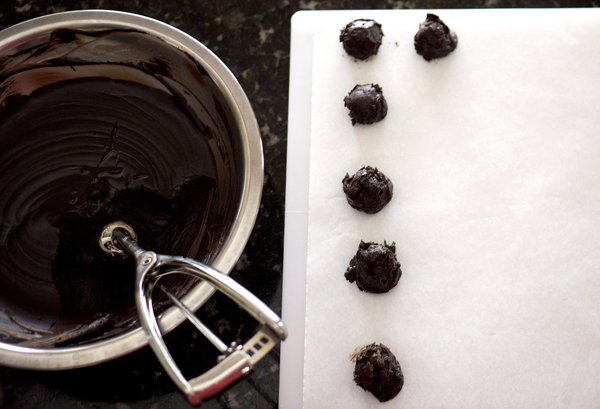 Using a disher, or spoon, portion out the chocolate mixture into balls around an 1″ in diameter. I was able to get roughly 30 balls. Refrigerate again for 15 minutes. Pour cocoa powder in a shallow bowl. 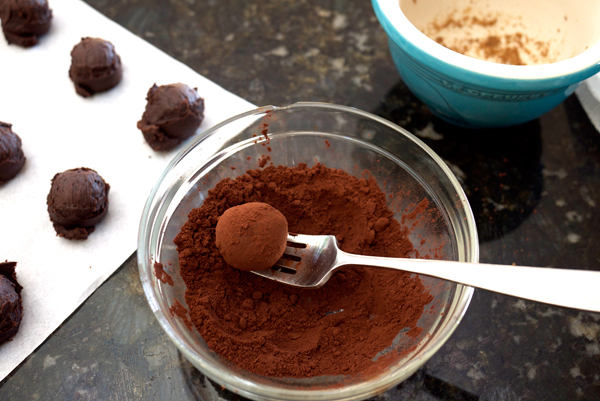 Take the truffles out and either toss directly into the cocoa powder as is using a fork to move around and coat the truffle, or smooth out the truffles into smooth balls and then coat in the cocoa powder. Coat the top of the truffles with ground Bailey’s crystals working quickly by hand. Your fingers will create some heat that might make the crystals warm and sticky. If you find this happening while you coat the truffles, refrigerate the mixture for 5 minutes and take back out again to finish. Set oven to 170°. 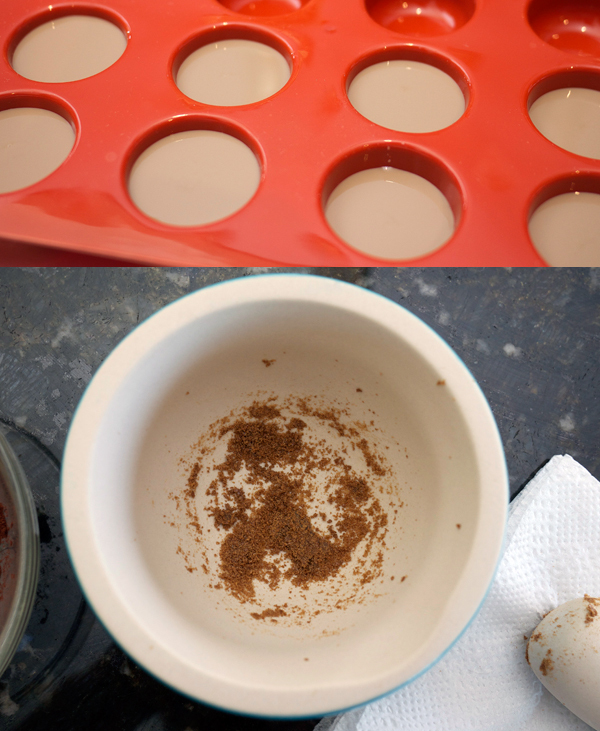 Pour Baileys into a silicon container and place into oven. As mixture starts to solidify on top, break up top bits to expose all of the liquid. Test for doneness starting after 18 hours. Like I mention above, my mixture hit its wall at 36 hours as some of the mixture was more like a caramel and never dried out. Remove from the oven and allow to cool. Break up all of the crystalized parts and, using a mortar and pestle, grind the mixture into a powder. Refrigerate in an air tight container until ready to use. 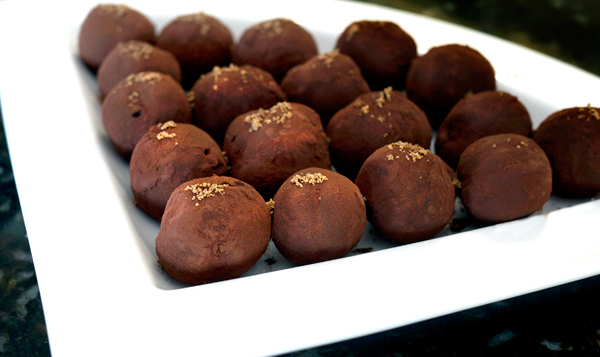 By combining the extra bitter and semi-sweet chocolate, these truffles are not too sweet, but have a deep earthiness from the dark chocolate with a hint of sweetness and the subtle flavor of the Jameson. The crunchy bits of the Bailey’s on top provide a touch of caramel sweetness.